how many popsicle sticks you use? would this work with minimal support on all flat surfaces, ie. the roadbed on top as well as the main “truss” edges? Thanks. Anyone? Just trying to get some help for a project. We at school are having a contest to see who can build the best bridge. But, instead of Popsicle sticks we are using… Spaghetti sticks. You are an inspiration. 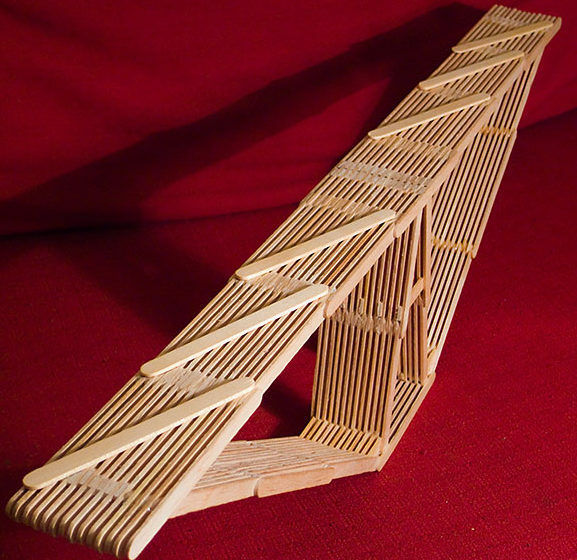 Not only did your bridge hold 553 POUNDS (that’s incredible) but with Popsicle sticks too. Thats what we have to do to and I was just about to ask about it because we are using balsa wood spaghetti sticks to. 51 queries in 0.549 seconds.